And cranberry sauce is at the top of many American families carte du jour. It’s the jellied log with the rigged sides or the freshly-made sauce cooked down from raw berries that ritually finds its way to dinner tables around the country. According to the Agricultural Marketing Resource Center, Americans consume nearly 400 million pounds of cranberries a year, 20 percent of this consumption is during Thanksgiving. Of that, nearly 5,062,500 gallons of the jellied sauce is consumed each holiday season. What is it about this ruby red treat, the combination of tart and sweet that makes cranberries a holiday staple? These small vivacious flavored berries have been documented as a part of the American culinary experience since the 19th century. The vibrant nutrient packed berries are one of three native North American fruits commercially grown. In the United States, cranberries are harvested each autumn, from mid-September until mid-November. This perennial crop is grown commercially in man-made wetlands or bogs, primarily in Massachusetts, New Jersey, Oregon, Washington and Wisconsin. According to the National Agricultural Statistics Service, Agricultural Statistics Board, and the United States Department of Agriculture, though cranberry produce is down 6 percent compared to last year, overall sales have not been affected. In fact, over the last 10 years, the US Cranberries Per Capita Cranberry Consumption Report reflects that 288,697 pounds of fresh cranberries were sold in the US and processed cranberry sales reached 6,253,106 pounds last year. Leading the charge as the country’s dominant supplier of cranberry-related products not just seasonally but year-round is Ocean Spray, an agricultural cooperative based in Lakeville-Middleboro, Massachusetts. Working with more than 700 cranberry growers and controlling more than 75 percent of cranberry farms in the U.S., Ocean Spray’s canned cranberry sauce appeared on the market in 1941, allowing the product to be sold year-round. It’s this same sauce, in a can, that Ocean Spray says 74 percent of Americans prefer each holiday season. 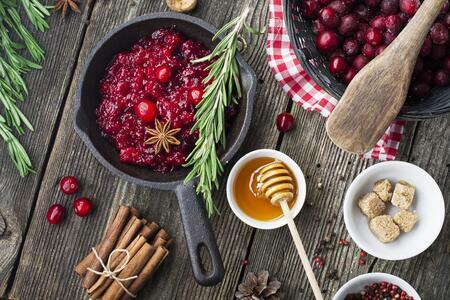 Cranberries are the evergreen shrub used in food, beverages, and dietary supplements. It’s the brightly-colored fruit that brings healthful phytonutrients and adds flavor to every-day meals and zest to festive occasions. High in Vitamin C, E, and K, the cranberry is a rich superfood that packs a powerful punch. It’s a treat that can be enjoyed all year long in many convenient forms, from fresh to dried or frozen. It’s the comfort of food, family and laughter that creates the memories and ambiance of the seasons we’ve come to love. And according to data, that red, tangy sauce is one that we’ll continue to indulge in during the holiday seasons and beyond. Nearly 95% of cranberries are processed into juices, sauce, dried, etc.